Beer gets no respect, many say. With all the changes in recent decades in brewing – the gazillions of craft breweries, the countless exotic beer types, the ceaseless innovation – one suspects in the culture at large not much has changed. Beer is beer, honourable but at bottom a quaffer, for informal occasions – cottage, the cheap and cheerful evening out, barbeque, office party, that sort of thing. For tony London West End or Upper East Side Manhattan restaurants, no. For the edgier hot names in Brooklyn or Bermondsey, well, maybe, for lunch. Beer, to the public mind, is not really part of gastronomy no matter the pretensions of some to elevate it there. The late chef and world food authority Anthony Bourdain, a democrat and populist in food and its customs, did not tarry on craft beer, which upset many of its devotees. Eloquent voices have spoken up for beer to be sure, writers have laboured especially since the 1970s in its service, many certainly talented. But even devoted beer people harbour the feeling that it gets, if not no respect, then not half to what it deserves. They open the papers and see beer treated as a generic item, after all this time, derided by food columnists who write, “don’t try wine, even Riesling, with [thus and such, often non-western, dish], drink beer”. Well yes but which one? Which type? Don’t you care? Not really. And the U.K. media still revels in those lurid, full-page stories about lager louts on the weekend high street. It delights in showing the Roman circus at music festivals where half-dressed party animals with glittering eyes clutch cans of lager or some other beer, maybe even craft beer. It’s anything but the dignified surroundings always associated with wine. The New York Times doesn’t have a dedicated beer critic, as most big city papers don’t. The job is handled by the wine expert, often. And so on. As the writer points out, the mere mention of beer among Britishers always, for some obscure reason which only psycho-analysts could track down, elicits a snigger. Clearly there is, in British minds, some curious repression about beer, some strange and infantile complex of snobbery, condescension, superiority, and guilt. The word wine never excites amusement. It is a noble word and tomes, learned and ecstatic, are written around it. A man who talked about wine in the way it is our custom to talk about beer— as if all wines were just wine— who did not know that Burgundy must not be warmed, that red wine must not be drunk with fish, or that the mouth of a brandy glass must not be less than two inches in diameter, would be scorned and spat on for a barbarian. But who knows or cares anything for the canons of beer-drinking? Who knows why beer should be drunk out of a metal vessel, what dishes go best with beer, how beer is made, what times are most proper for absorbing it, and what its varieties and potencies are? If you go to a good restaurant you will find all the wines impressively set out and divided and sub-divided — all the Chateau Lafittes, the Chateau Margaux, the Chateau Yquems, the Chambertins, Clos de Vougeots, the Romanee-Contis, the Nuits St. Georges, the Steinbergers, Rauenthalers, Geisenheimers, Heidsiecks, Bollingers, Clicquot-Ponsardins, the Moet and Chandons. And stuck away in a corner you will see, perhaps, “Also Beer” — as in the passenger list of a liner you read “Lady So-and-So, and General Such-and-Such, and Mr. This and Mrs. That; also 250 in the steerage.” As if the 250 in the steerage had the vast, composite, undifferentiated personality of a bee-hive! As if beer, to a connoisseur of beer, was not also divisible into an infinite variety of classes and sub-classes! But connoisseurship of beer is one of the neglected graces of life, and the “Book About Beer” is an indignant protest against this. You can read Penton’s full remarks here, published in his column The Sydney Spy in the city’s The Daily Telegraph. Maintaining the same wry, mock-indignant tone as above, he mounted one of the best defences of beer seen prior to the 1970s, when serious beer critique starts in earnest. The book in question seems consigned to minor status in the annals of beer appreciation. It was anonymous, credited only to A. Drinker. Snippets have been discussed by beer writers in recent years, but nothing revelatory seems to have come from the tome. Penton’s review of the book and literate defence of beer may be the best thing. Rare book dealers still sell it though, see one on offer, here. Penton was a grammar-school chap, like that well-known U.K. beer writer Michael Jackson (1942-2007). Good writing about beer doesn’t need university credentials but neither are they a particular bar. Beer is, when all is said and done, a worthy, even noble subject, but one that remains equal-opportunity. He had been one of Australia’s great newspaper editors, an important novelist, a passionate but critical Australian nationalist, and a courageous liberal campaigner for what he called ‘a civilized mode of social living together’. Obs. Writing of the calibre of Penton’s – I’m speaking generally now, not of beer as such – seems a neglected grace. Our relentlessly earnest age doesn’t prize the levity of past times, useful as it often is beyond the merely entertaining. Note re images: The quotation above is from Penton’s news article linked in the text, available via the Trove digitized archive. 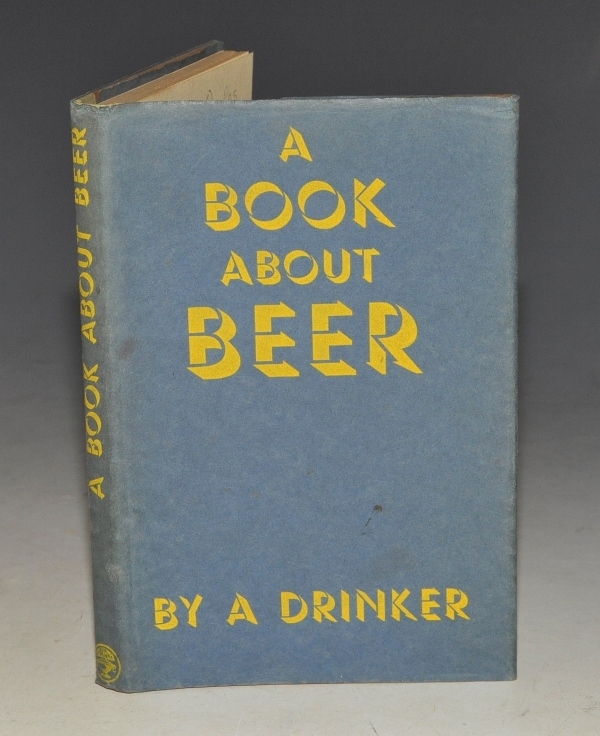 The cover of A Book About Beer is drawn from the vendor’s site also linked in the text. All intellectual property in the sources belongs solely to their lawful owners, as applicable. Used for educational and historical purposes. All feedback welcomed.